The Nakajima Ki-49 Donryū (Storm Dragon) was a twin-engined heavy bomber used by the Japanese Army in New Guinea and China (Francillon 1979, 223-9). On December 14, 1944, most remaining Donryū aircraft took off from Clark Airfield in the Philippines to carry out suicide attacks. The special unit formed for these attacks was called the Kikusui (Floating Chrysanthemum) Corps. The attempted attacks caused no damage to the American fleet off Negros Island, and 13 Donryū crewmembers from the 74th Sentai (Regiment) and 34 Donryū crewmembers from the 95th Sentai perished (Tokkōtai Senbotsusha 1990, 259-60) . On December 6, 1944, five soldiers from the 74th Sentai and five from the 95th Sentai landed with paratroopers at American-held airfields in the Philippines, and these two suicide squads destroyed several American planes in the attack (Tokkōtai Senbotsusha 1990, 263; Warner 1982, 142-3). Survivors from the 74th Sentai and 95th Sentai erected a stone Jizō statue in 1975 near the main gate to the Zen Buddhist temple at Engakuji in Kamakura. Jizō is a popular Buddhist deity who works to ease suffering and who is portrayed as a monk with a shaven head. 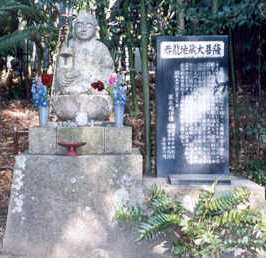 Jizō statues can be found throughout Japan. Donryū Type 100 bombers soared through the skies of the Far East. During battle in the Philippines, the Donryū made a number of bombing attacks at Leyte and Mindoro. Soldiers ready to lay down their lives for our country formed the Kikusui Tokkō Corps and carried out deadly body-crashing attacks against the enemy task force. They also landed together with a paratroop squadron at the enemy airfield at Tacloban and became a kirikomi unit that made a banzai charge. The squadrons that remained behind in that land of pestilence endured starvation, fought bravely for an eternal cause against great numbers of the enemy, and moved the gods to tears. Fortunately, today our dearest wishes have been realized. We have opened the eyes of the Donryū Jizō Great Bodhisattva, and we have consoled the spirits of all those soldiers who died in battle or of disease. Donryū Jizō Great Bodhisattva, we beseech you for world peace, supreme happiness for our war comrades, and prosperity for the Japanese people. Engakuji dates back to 1282, and the grounds include 18 branch temples and two National Treasures. Engakuji's famous temple bell, the largest in Kamakura, was donated in 1301 and stands at the top of a hill that can be reached by a long flight of steps. The other National Treasure at Engakuji is the Shrine of a Sacred Tooth of Buddha. 1. Tokkōtai Senbotsusha (1990, 327) and other references do not mention the number of planes that participated in the suicide attacks. The Donryū bombers were stripped down for use in the suicide attacks, and it is not clear how many crewmen were in each plane. Francillon (1979, 228) states that the Donryū typically had a crew of eight: pilot, copilot, bombardier, navigator, radio-operator/gunner, and three gunners in enclosed cockpits. However, it is unlikely that any of the planes used for the suicide attacks had this many crewmembers.